Creating a website for an automotive business is no easy feat especially if you want a quality good looking website, with all the bells and whistles. The best and quickest way forward would be to set up a site using one of the best car mechanic WordPress themes and be on your way! Having a brick and mortar business and not having an online presence is essentially business suicide in today’s interconnected world. Customers expect you to be on the web in some form or the other. If doing a quick search on Google for “car mechanic near me” or “auto service workshop” does not yield your website, potential customers will probably be reaching out to your competitors in the area for services. These themes are all responsive and are optimized for search engines. Some of these have WooCommerce capabilities in case you want to sell and showcase your goods or services online. Since these are specifically designed for the automotive industry, they are suitable for auto repair shops, car mechanics, garages, towing companies, auto parts shops, or car detailing shops. All these automotive themes require a self-hosted WordPress site. You will need your own domain name and web hosting. and hosting for as little as $3.95/month! CarPress is a wonderful theme, filled with features and very easy to set up. CarPress is incredibly powerful with a high quality design; a carefully crafted WordPress responsive auto service theme that caters to any sort of auto service provider website, ranging from car washes and garages to car repair shops, auto painting, brakes servicing, car rental, vehicular inspections, and all sorts of small business services, including handymen and repairmen of all kinds. It comes with three home page versions, each with a wonderfully useful slider that can display hours of operation, link to a quote form, and other useful information right upfront. 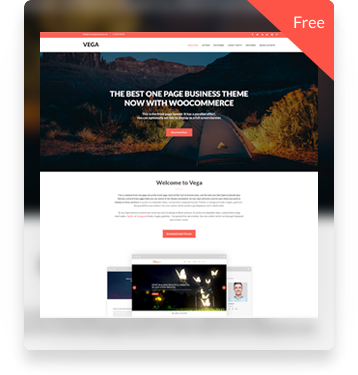 The theme is also WooCommerce compatible, thus giving you the capability to sell items online or offer to receive payments for your services on the website. It also fully integrates with the Contact Form 7 plugin so you can create appointment and quote forms with ease. The theme has been translated to 7 languages including German, Spanish, and French. Main features of CarPress are: WooCommerce compatible, lots of theme options, real time WordPress customizer, WPML compatible, WooCommerce integration, support for Contact Form 7, Jetpack, Custom Sidebars, and Fancybox for WordPress. Auto Repair & Car Mechanic is a theme specifically built for auto mechanic and car repair workshops. It is also suitable for car washes, garages, auto painting, auto centers, body shops, auto inspections, and other car related services. It has focused design that comes with the ability to display opening hours, consulting and appointment forms, practice areas, case results, Q&A and team members pages. The theme is intuitive and requires no coding skills in order to build a professional looking, fully functional and engaging website for your car service business. The theme can be easily customized to match your brand and comes with 4 pre-built home page templates that you can start from and then mix and match more options to create a completely unique website for your company. Main features of the Auto Repair and Car Mechanic theme are: multiple home page templates and header templates, fully responsive, top notch customer support, endless layout possibilities, high speed performance, fully integrated with Contact Form 7, multiple footer styles, easy parallax builder, CSS animation option on most elements, 30+ custom ready to use pages, 4 predefined skins, 600+ Google Fonts, one click demo installer, translation ready, sidebar manager, Revolution Slider, icon font manager, mobile support, coming soon and maintenance mode, drag and drop builder, WooCommerce ready, Gravity Forms compatible, bbPress ready. 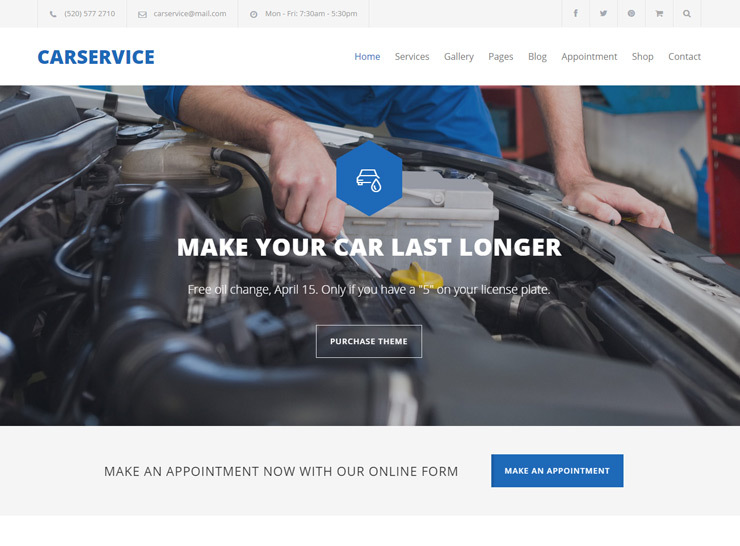 Car Service is an intuitive, easy to use theme that can be used to build a professional looking, highly functional, serious and interactive website for your auto service and car mechanic business. 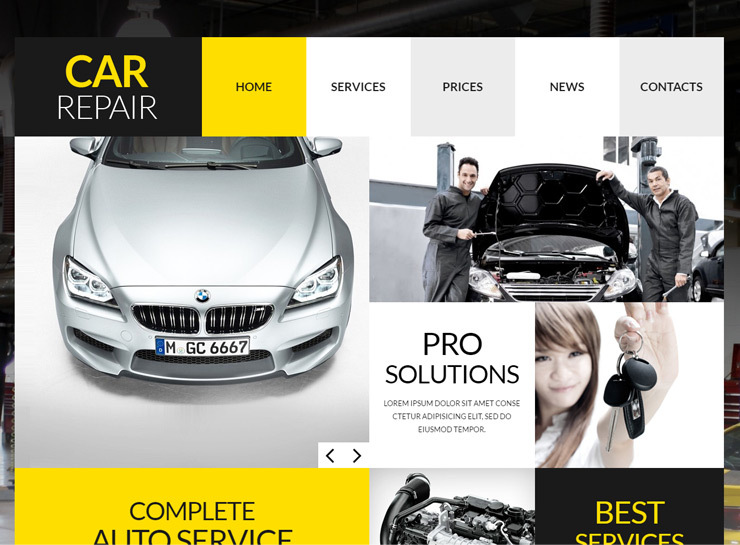 This theme is one of the very best car mechanic WordPress themes and has a very high standard of quality. The niche design is suitable for auto repair services, auto body shops, or car mechanic businesses. 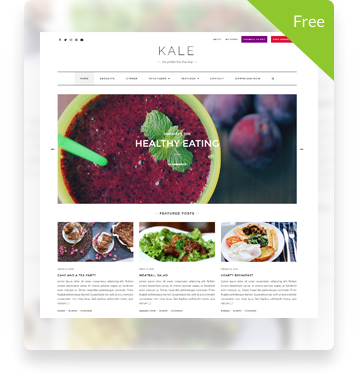 The theme comes with the option to have a full width or boxed layout, with multiple color options and background patterns and images. 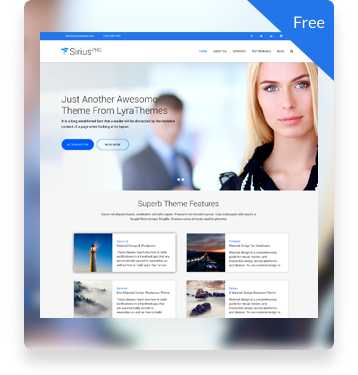 This theme can help you create a clean, professional-looking, high quality website that is mobile friendly and easy to setup. Regardless of your business type, this theme can accommodate your needs. Key features of Car Service are: appointment forms, Slider Revolution, Visual Composer, 90 premium car related font based icons, 12 page templates, sticky menu, touch friendly slider and carousels, ajax conytact form, custom colors, smart sticky columns, one click demo importer, drag and drop page builder, 50+ content elements, WooCommerce integration, themes options panel, RTL text, wide and boxed website layouts, multiple blog layouts, built in isotope gallery, 800+ Google fonts and more. 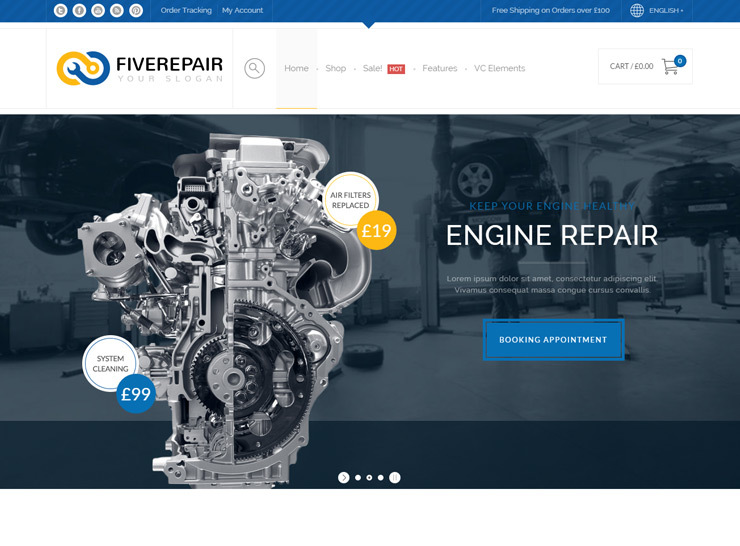 456 Repair has a lot going on for it – feature packed and professionally designed, it is a natural choice for a car mechanic WordPress theme. It has multiple customization options with complete control over fonts, background color, and colors. This is a robust, solidly coded, and beautifully designed theme with great attention to detail. It optionally places the appointment booking form right on the home page hovering to the right so it is accessible from anywhere, quickly. This is a convenient, time saving solution for building a website suitable for car mechanics, auto repair workshops, handymen and other services that are in need of an online presence. Main features of 456 Repair are: Visual Composer, WooCommerce, WPML compatible, multiple header variations, Smart Sidebars Slider, Pretty Loader, Logo Carousel, Shop Assistant, Easy Tables, Layer Slider, custom colors and skin building. 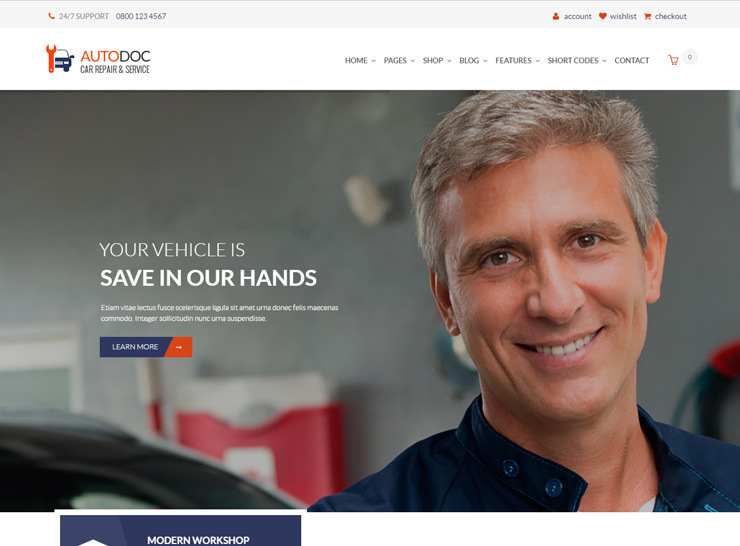 AutoDoc is an extraordinarily stunning and vibrant WordPress car mechanic and auto service theme that is versatile and powerful enough to create a unique, brand specific website for your car repair, auto servicing, or auto workshop related business. Create smooth sliders using the included Slider Revolution, and customize each page thanks to the Visual Composer page builder that comes with the theme. WooCommerce integration means that you can sell your services and products online and offer coupons and online payment processing if necessary. The theme can be used to create a handsome website that inspires trust and reliability, and effectively represent you and your business in the online webspace. If your company deals in the servicing, repair, or detailing of cars, trucks, motorcycles or any kind of vehicles, this theme can help you create a professional looking website that is clean and dependable in minutes and help you capture new customers through the Internet. Main features of AutoDoc: multiple home page variations, video documentation, revolution slider, Google fonts, Visual Composer, WPML support, Contact Form 7 support, WooCommerce integration, one-click demo import. Garage is a versatile, vibrant, and amazingly unique take on a car mechanic and auto service WordPress theme. It serves as a as a powerful solution for any car related business such as automobile workshops, cars repair shops, auto blogs, other car services websites that require special niche functionality and auto service presentation. A website created with this theme will inspire trust and reliability. 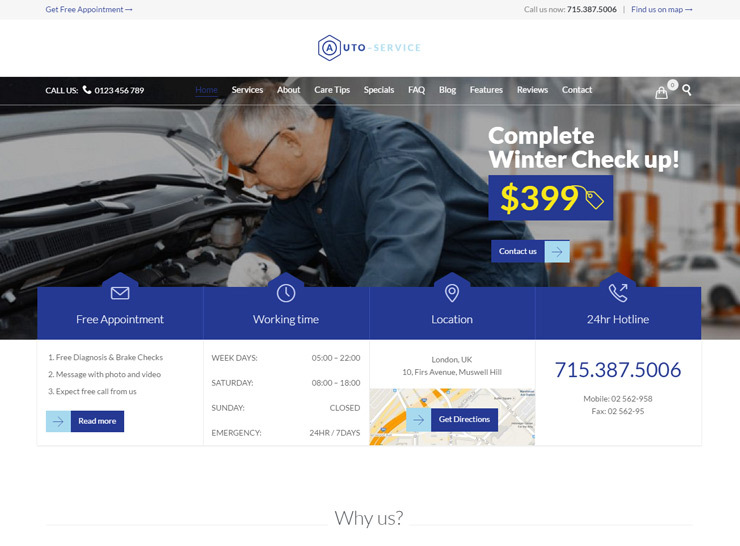 The theme is incredibly flexible and modern and is versatile enough to be converted into different types of auto service applications such as car washes, car repair shops, car detailing, and many more. Every part of this theme has been designed keeping in mind the automotive industry niche and it also has some convenient and specific auto service related pre designed and configured pages that you can use to house your own content in minutes. Pricing, contact forms, product catalogs, widgets, and shortcodes are just some of the tools that can be used to create a brilliant and content rich website for your auto business. Main features of Garage are: WooCommerce ready, WPML compatible, integrates well with popular plugins, 99+ custom shortcodes, Layer Slider, Revolution Slider, custom page options, multiple blog layouts, animations, custom colors, custom post types (projects, profiles), content templates, drag and drop builder, fonts, headers. 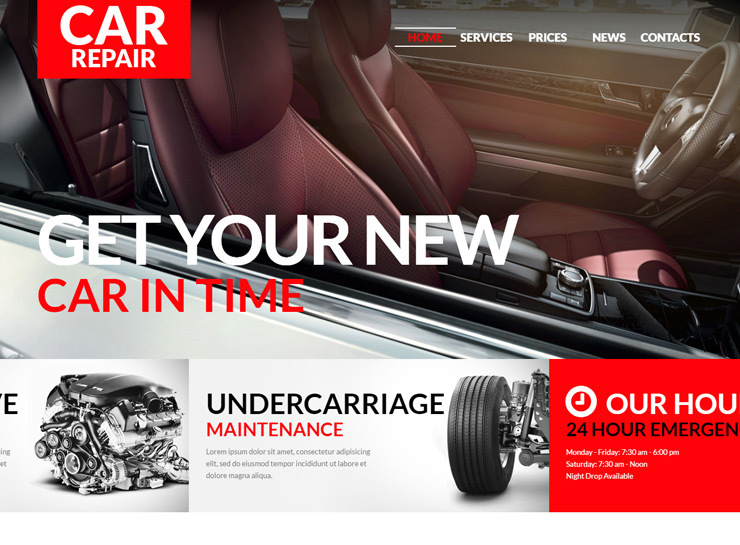 Car Workshop WordPress Theme is a striking, robust and high quality, thoughtfully created WordPress theme specifically created for car mechanics and auto repair businesses. The boxy look and feel is very masculine and bold, and provides for a refreshing and unique web experience. The theme puts your most important assets right on the front page, in different panels. The internal pages are clear and well thought out with multiple formats to choose from. This edgy theme is full of character that inspires trust and confidence to help you effectively capture new business clients through the Internet. It has custom post types and formats, is fully editable, and customizable. 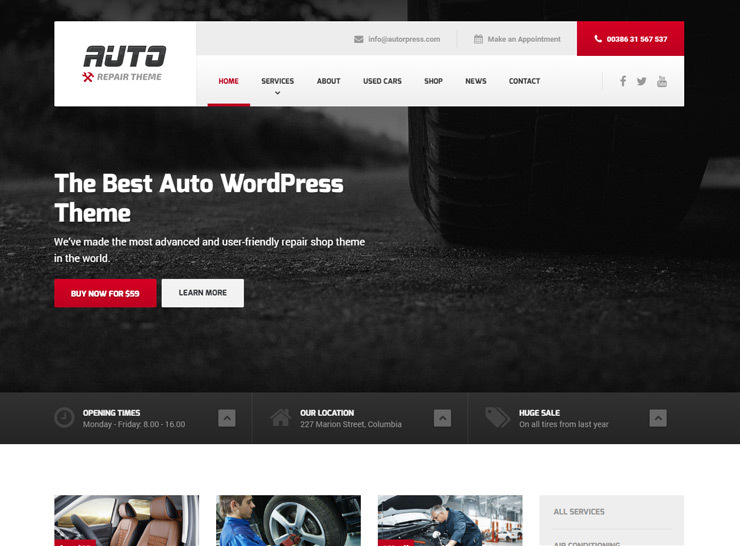 Backed by solid code and wonderful support, and free lifetime updates, Car Workshop WordPress Theme is a great choice for your car mechanic business theme. Main features of Car Workshop WordPress Theme are: WPML compatible, 80+ shortcodes, custom post types, custom formats, fully editable, custom typography, filterable portfolio, custom widgets, multiple color options, SEO ready. 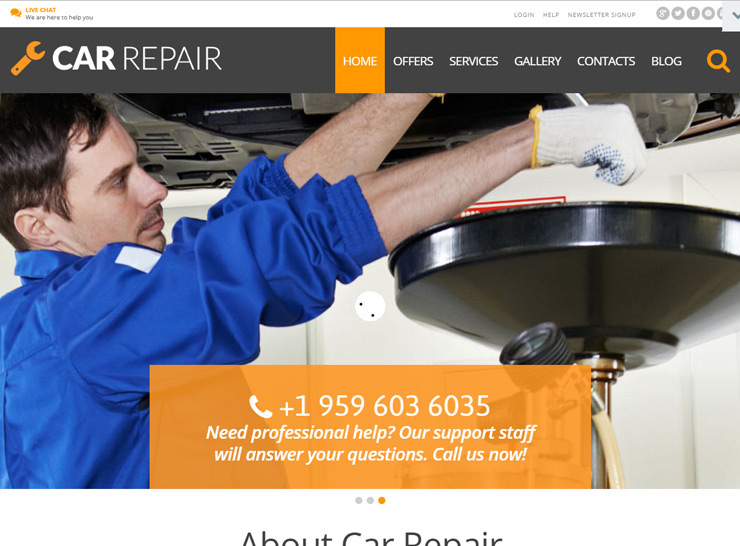 Carshire is a theme specifically designed and developed for auto mechanics, car repair shops, car washes, garages, auto painting, auto centres and other auto and car related services. It is suitable for users with zero programming skills as well as advanced developers. The bold yet clean design exudes reliability and trust, and provides ample opportunities to house your content in multiple formats, such as galleries, quote boxes, sliders, call to action areas, team section, services section, and testimonials. The theme has both full and boxed width layouts and the colors can be customized to match your brand. You are guaranteed an aesthetically accomplished, fully functional and thoroughly thought out website that will help you create an engaging and inviting experience for your website visitors. 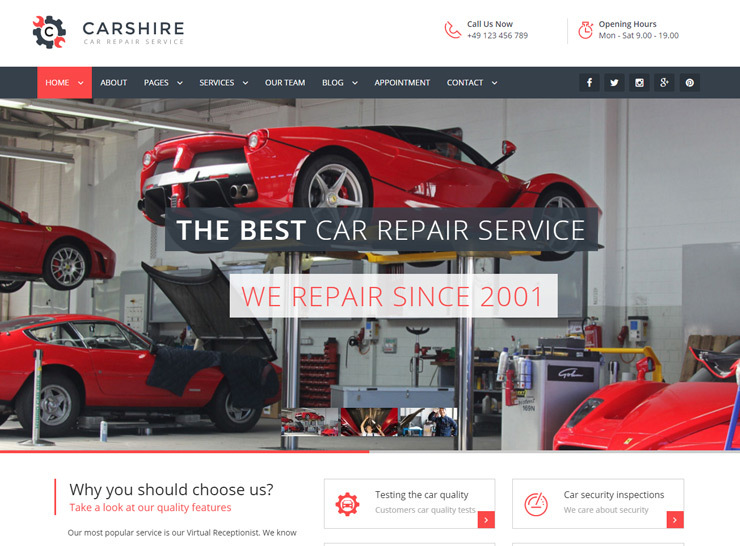 Main features of Car Shire are: one-click demo install, Visual Composer, Revolution Slider, 2 service page layouts, WPML, parallax effect, many modules and shortcodes, smooth transition effects, multiple blog layouts, page templates. 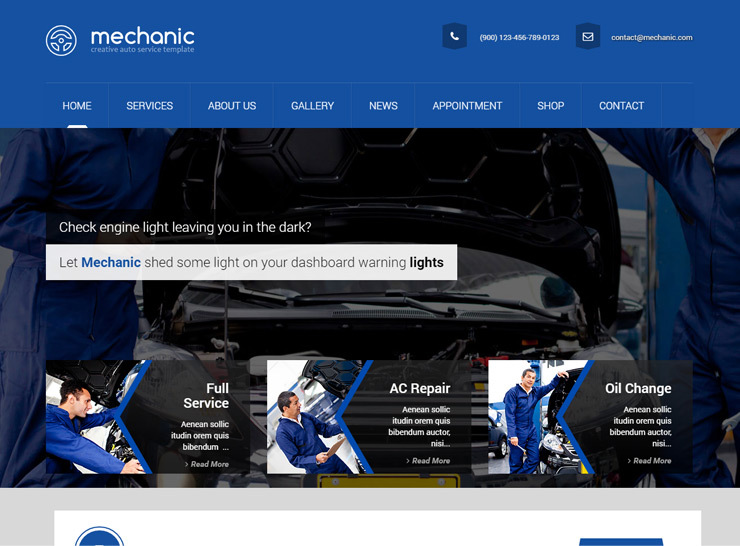 Mechanic is a technologically sophisticated, aesthetically accomplished, throughly engaging, easy to use and flexible auto service and car mechanic WordPress theme. 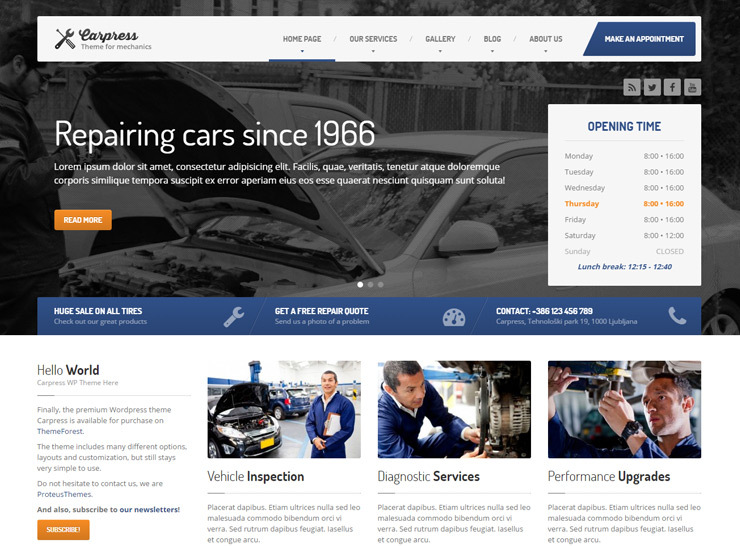 This theme can be used to create a website for car body shops, auto paint shops, car mechanics, auto repair shops, auto glass installers or general auto repair service center websites of all kinds. The theme comes with a powerful admin panel and comes with ultra flexible header and navigation options. It comes with unlimited sidebars and has multiple blog layout options. You can use a custom shortcode creator that is proprietory to the theme creators or use the very popular Visual Composer plugin to create engaging and detailed pages with different kinds of content. The dark, clean, and bold design helps present your company in a professional and inviting light and creates a web presence that engages your customers and provides multiple means for interaction with potential and established customers. Bring your car repair shop to the next level with this theme and you’ll never look back! Main features of of Mechanic are: WooCommerce ready, RTL support, video tutorials, WPML ready, user friendly shortcode generator, powerful admin panel, unlimited sliders, Visual Composer, Font Awesome icons, Google Fonts, custom widgets. 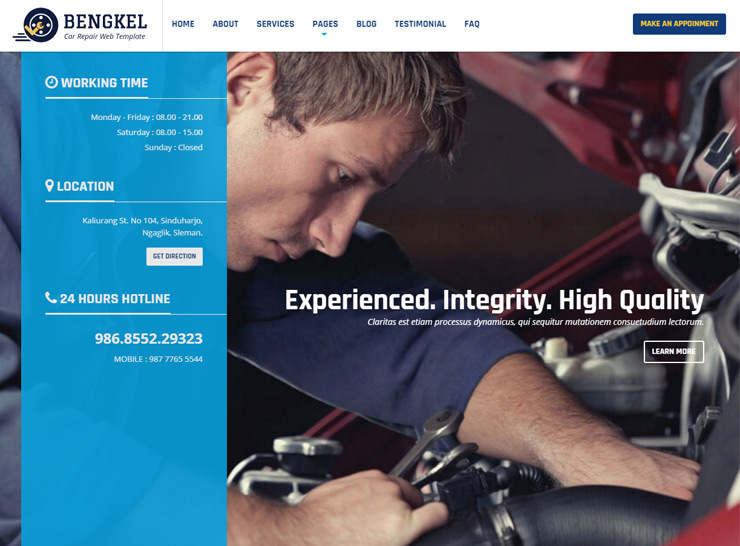 Bengkel is a automotive business WordPress theme with a modern and bold design. The theme is intuitive and easy to use, user and mobile friendly, and functionally flexible. Putting the main information, such as store hours location and contact number, that a customer may be searching for front and center, your website will come off as user friendly yet visually appealing thanks to the large full width slider that runs across the top of the site. The theme comes with Page Builder which lets you drag and drop elements to create unique layouts for your content. There is a one-click demo import feature which helps you set up a starting point for the website and then tweak and customize the theme according to your needs. The home page boasts testimonials, a contact form, and a team section that showcases the highlights of your business and keeps the user enganged with relevant and interesting content.